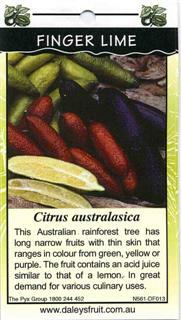 The Emma finger lime is a very large black skinned fruit with vesicles that range from clear to a pinkish blush. It produces a heavy crop of fruits over a long period. The fruits can be frozen successfully without destroying the fruits flavour or texture on thawing, thus allowing us to have access to the fruits all year round. i love the idea of growing food trees that are so everyday in culinary use, that are native. Such an exciting fruit, sure to impress with fantastic taste as well as appearance. Got a small sub tropical rainforest going and want to use as many natives as possible- (hard with quarantine laws as WA doesn't have rainforests). want to landscape with food plants, eat all of the garden. still v small and in pot. Shold I plant this in a native soil mix (low phosphorous) with lots compost?